We have seen BlueWatchDog product that can be used to safeguard personal belongings using Bluetooth wireless technology, now there is a new product that can provide even better functionality utilizing similar wireless mechanism. 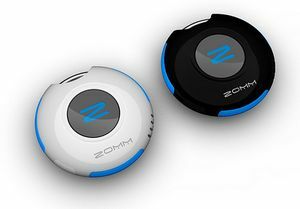 Named as Zomm, it is a Bluetooth enabled gadget that can be used to pair with your mobile phone so that whenever the mobile phone is left behind and out of coverage range, it will able to alert users by means of vibration and alarm for necessary actions. The mechanism behind is based on the Bluetooth device pairing between the gadget and mobile phone and whenever there is a change of state or lose of connectivity, it will vibrate first followed by an audible alarm sound with intention to get users’ attention, as similar to what can be provided by BlueWatchDog. But what makes it unique here is with its ability to serve as personal security system that can be programmed to call emergency rescue center directly with a single panic button press when in any critical situation. That is not all, Zomm can also be used as a speakerphone system for voice communication to take place, either at home, office or while on the move. No pricing and availability yet, Zomm is designed in a keychain-like tiny form factor and is definitely a good companion to be carried around especially useful for frequent travelers or anyone that intends to safeguard themselves and their belongings.